Our water filters provide an immediate solution to the problems associated with dirty water. Communities still need to travel, sometimes many hours a day, to collect water, but the contaminated water they collect is made safe by using our water filters. The water filters we send to Ghana are really easy to use and maintain. They remove dirt and diseases from the water so it is safe to drink. An amazing 99.9% of of viruses and 99.999% of bacteria are removed by the filters. Take a moment to look at this short demonstration of a family filter to see how easy to use and effective they are. One of these costs just £30. 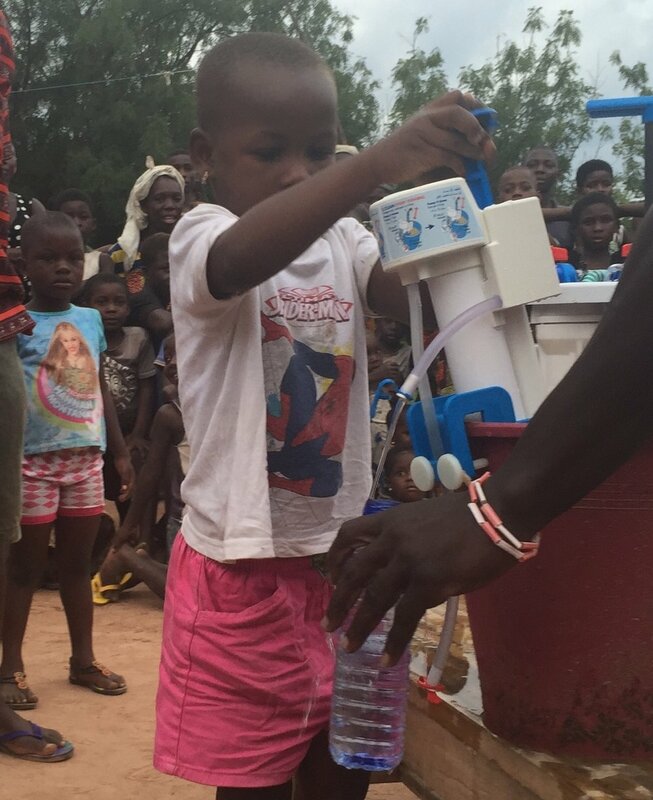 We buy these water filters directly from GrifAid, the UK manufacturer and ship them to our Partners in Ghana, Fred and Rebecca, who then distribute them to the communities that are most in need. We don't just distribute our filters, we also educate the communities on the importance of using them and how to use and maintain them. If used and maintained in the correct way a water filter should last a community for more than 5 years. We provide two kinds of filter - a family filter and a community filter. Family filters are designed to go to a home, to provide clean water for a family. The added benefit is that they are small and easy to transport from house to house, so in some communities you find 4 or 5 homes sharing a family filter. They cost £30 and can provide clean water to around 50 people. These are larger filters and are designed to serve a community of up to 500 people. Quite often we will give them to a school or medical centre as this becomes a hub in the community where everyone gathers to clean their water. You can help provide water filters to Ghana by donating here. Or why not send one as a gift, by using out Gift Certificates?